1. Celebrating Eid ul Fitr with the Family. It was all about road trips and staying cool in the malls, but spending it with the loved ones is what is most important. 2. Praying Jummah (Friday Prayers) at the Shiekh Zayed Grand Mosque in Abu Dhabi. It is simply stunning in there. 3. Good food and good company. Always one to be thankful for. 4. Having husband return safe and sound from a short business trip. 5. Watching Baby Z have such a great time splashing in the swimming pool during our staycation at Al Raha Beach Hotel. 6. For new opportunities and prospects thanks to this blog. 7. Spending quality time with Baby Z and not having to worry about the mess! 8. Watching photos of my dear friends getting married and finally join the “We’re Married” Gang! Wish I was there to witness these special moments, but pictures will have to suffice. 9. Finally having the courage to begin Potty Training Baby Z! 10. Walking into an AC controlled cool room after being in the blazing Dubai Summer Heat for roughly two minutes. 11. For not being addicted to Pokemon Go. Enough said. 12. Hearing Baby Z say new words almost every day! Though it doesn’t quite sound the same as the actual word, it fills my heart with pride! 13. Having a throat tickle dissapear after taking five Honey and Lemon Strepsils. 14. Watching Baby A (my niece) be spoilt and smiling widely in the arms of my parents (Her grandparents) back home in UK, during their month long vacation there. I miss her plenty, and so does Baby Z, but I am equally happy she is having such a great time there! 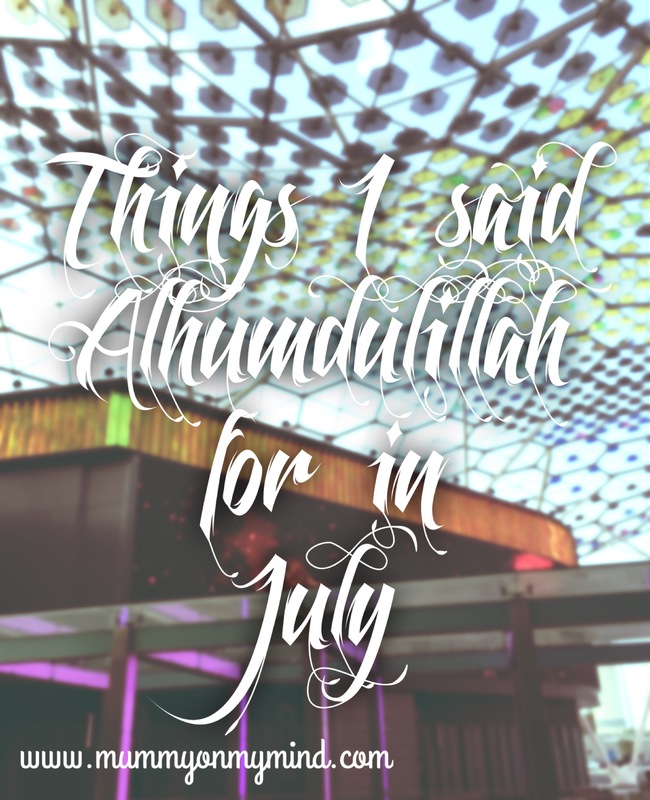 I love your list of gratitude every month – it reminds me of how important it is to always be thankful to the Almighty for every little time here. Thank you so much, that is very kind. Yes, I agree, it really is so important to be grateful for a more positive outlook on life. Those are some lovely things to be thankful for, most of all the AC everywhere! haha yes, what would we do without AC!!! Thank you! Glad you enjoy the Alhumdulillah series. I always follow this lovely series every month and it’s beautiful. Thank you that is very sweet of you! Glad you enjoy the series!